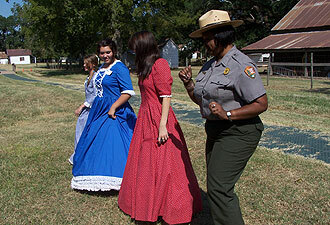 Ranger Tarona Armstrong does a line dance with the Calico Belles during the 2010 Fall Tour of Homes. 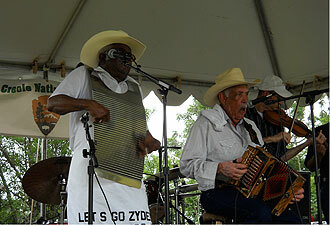 Goldman Thibodeaux and the Lawtell Playboys perform during the inaugural Cane River Music Festival. Visitors are drawn to Natchitoches for a variety of reasons. Many come for the annual Christmas Festival or to visit locations from the film Steel Magnolias. Some come to partake of the area's world-renowned meat pie. Some visitors are lucky enough to stumble upon one of the country's newest national parks, Cane River Creole National Historical Park, and the adjoining Cane River National Heritage Area. 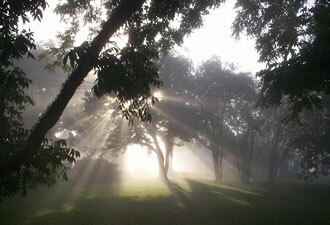 The park consists of two sites along the Cane River, Oakland Plantation and the Magnolia Plantation Complex. Less than 20 years ago, they were still occupied by descendants of the founders of each. Today these two plantations are part of Cane River Creole National Historical Park, and many surrounding sites belong to the heritage area. Oakland and Magnolia—both able to be toured—were occupied for nearly two centuries, resulting in a diverse historic landscape dotted with buildings. Some are approaching their bicentennials, while others are barely half a century in age. Today these buildings—sheds, shops, storehouses, living quarters of slaves (later, plantation laborers), a gin barn for processing cotton, and more—tell the multi-generational story of the people who lived and worked on this land. They faced their share of tribulations: the Civil War, boll-weevil outbreaks, and the Great Depression touched these plantations. Even freedom, post-Civil War, for those enslaved here proved ambivalent. Although emancipated, many former slaves suffered under sharecropping arrangements and Freedmen's Bureau labor contracts, the conditions of which differed little from slavery. Aside from being the ideal spot to learn about two centuries of Louisiana plantation life, Cane River Creole National Historical Park is the perfect place to immerse oneself in the Creole culture. The definition of “Creole” is often debated, but most agree that it is a cultural identity. Creoles share great music and food, a language, and Catholicism, but perhaps the strongest bond among them is their generational ties to the Cane River region. If you visit Cane River Creole National Historical Park and the Cane River National Heritage Area, you might begin to understand the strong connection between the people and their ancestral home. One only needs to admire the towering oaks, taste a freshly cracked pecan, or gaze upon an endless field of corn or cotton to understand Cane River's power of place. Whether you're in the area looking for the perfect meat pie, or walking in the footsteps of Julia Roberts and Sally Field, you won’t be disappointed if you stumble upon this hidden gem of a national park. To discover more of the attractions of Natchitoches, Louisiana, as well as the region's history, please see the article “An Island in Time,” published in the National Park Service magazine Common Ground.